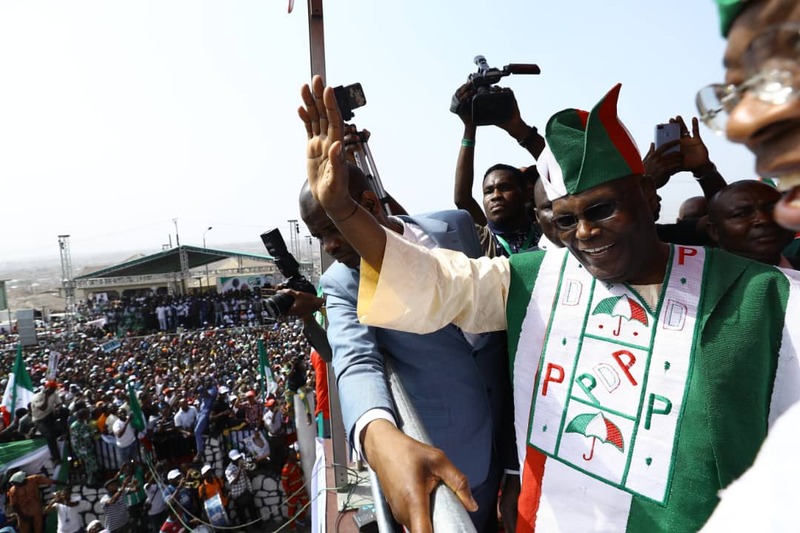 Presidential candidate of the Peoples Democratic Party (PDP) and former vice president Atiku Abubakar has said Nigerians must vote out President Muhammadu Buhari of the All Progressives Congress (APC) during the presidential poll in February 2019. He said this during the PDP presidential South West zonal campaign, at the Mapo Hall Arcade, Ibadan, the Oyo State capital, yesterday. The rally was attended by Atiku’s running mate and former governor of Anambra State, Peter Obi; Senate President, Bukola Saraki; PDP National Chairman, Uche Secondus and former governor of Ekiti State and South West Coordinator of Atiku/Obi Campaign Council, Ayodele Fayose. The list also included governorship candidates of PDP in Oyo and Lagos states, Messrs Seyi Makinde and Jimi Agbaje, respectively; President General, Presidential Campaign Committee and former governor of Ogun State, Gbenga Daniel; the 2019 governorship candidate of PDP in the September 2019 governorship poll in Osun State, Ademola Adeleke; former governor of Osun State, Prince Olagunsoye Oyinlola, and Senator Dino Melaye, who anchored the programme. In his remarks, Secondus alleged that APC government is raising money to fund its presidential campaign from Nigerian Ports Authority (NPA) and other agencies of the Federal Government. Atiku, in his address, said: “Buhari must go, lie lie must go. My fellow brothers and sisters from the South West, in the next two months you will be required to make history in this country. Since the time of democracy in 1999, the best prosperity we have enjoyed in this country was under the PDP. The best peace we have enjoyed in this country was under the PDP, the best educational advancement that this part of the country enjoyed was under the PDP. “Then, in 2015, some liars deceived you. People came here to deceive us and we believed them, we gave them the opportunity. They said they were going to create jobs, instead of creating jobs, we have lost 12 million jobs since they came to power. They said they were going to create prosperity. Since they came, we have gotten poorer to the extent that, today, we have surpassed many countries in the world in poverty, and now the headquarters of poverty in the world. Is that the type of government you want to continue with? “I stand before you here, today, to promise you that we shall return your prosperity and the prosperity of this country. Everybody knows that I chaired the best economic team in this country which produced those reserves. If you give me the opportunity again, I will assemble the best economic team, so we can return prosperity to our country. The South West has been known for its educational strides before independence. We shall continue to invest in education to make sure this zone excels. “Let me tell you, one of the most important policies I’ve advocated is the restructuring of this country. Today, I stand before you to pledge that within six months, if elected, we shall start the process of restructuring the country. “I’ve lived in this city (Ibadan). I grew up in this city. So, I’m not a stranger here in Ibadan. Therefore, do not believe the APC again. I will work with you to make sure the South West is returned to the PDP in the next election. Also, Obi enjoined the people in the South West to give their mandates to Atiku. Secondus said: “We can see that your coming here, this afternoon, has confirmed that you want a change in government. “But, one person tha who APC is afraid of is Atiku. Why are they afraid of Atiku? He is the only man who can rescue Nigeria, because Nigeria is in crisis. A man who has been tested, a man who has been tried, a man who has served and achieved a lot in the public service and, also, in the private sector. In their separate addresses, Fayose and Daniel, urged the people of South West to reject APC and vote for PDP during the 2019 general election.